To protect the privacy of your medical records, patients must submit requests to inspect or obtain copies of medical records in writing to Rome Memorial Hospital Medical Records Department, 1500 N. James Street, Rome, NY 13440. A fee for the costs of copying, mailing or other supplies associated with your request may be charged in accordance with Hospital policy and New York State Law. Please click here for a printable release of medical records form that you may complete and mail to Medical Records. If you have any questions, please call 338-7139. Rome Memorial Hospital and our affiliated physician practices also offer patients secure online access to portions of your medical record. 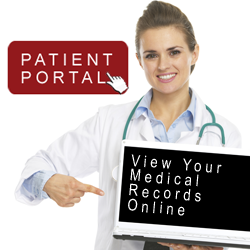 Click on the icon to learn more about our Patient Portals.